At our November meeting (Thursday, November 15 at 6:45 p.m.), we will celebrate the birthday of the King of the Cowboys, Roy Rogers. 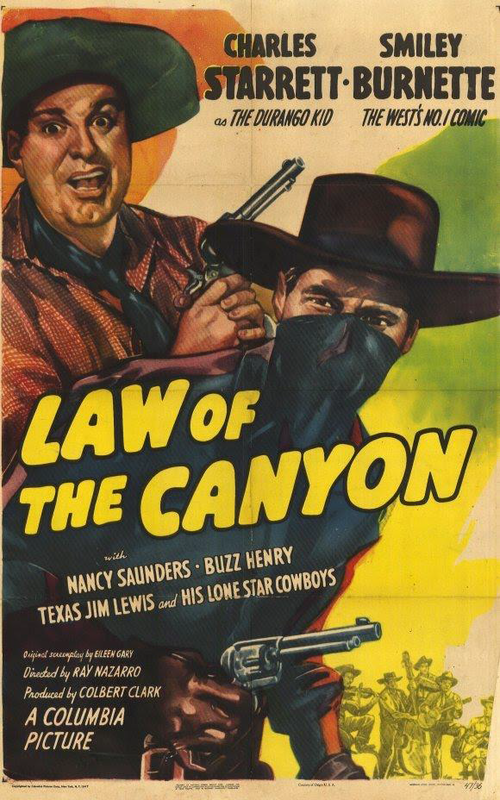 The first feature is Ridin’ Down The Canyon (Republic, 1942) starring Roy Rogers, George (Gabby) Hayes, Bob Nolan and the Sons of the Pioneers. Directed by Joseph Kane. Feature #2 is Marshal of Mesa City (RKO, 1939) starring George O’Brien, Virginia Vale, Leon Ames and Henry Brandon. Directed by David Howard. Chapter 8 “Lured Radium” from the serial The Batman (Columbia, 1943) Starring Lewis Wilson, Douglas Croft, J. Carrol Naish and Shirley Patterson. Directed by Lambert Hillyer. Two Biggies from Columbia. . .
. . . Columbia Studios, that is! No TRICKS, just TREATS! For October, we have The Durango Kid and Wild Bill Elliott! Enter your email address to follow our Club News and receive notifications of new posts by email.